If you had told me five years ago that I’d give up dairy and gluten, I would’ve laughed at you. And then probably stuffed my face with crackers and cheese. Actually, if you’d told me that five months ago, I would’ve told you that not eating meat and focusing on whole foods as much as possible was quite enough, thank you. But, as I shared with you a couple of months ago, I realized it was time to try something new — not because I felt like I was eating “bad” foods or because I wanted to lose weight or anything like that, but because I wanted to try a new way of addressing my inflammation issues. I’ve now been at it since the end of January, and thought I’d share a few of the things that are making the transition a bit easier — as well as what I’ve learned. In addition to making a point to eat salmon very regularly — which usually means I have my husband blacken a large fillet, I eat some for dinner, and then save the rest to eat cold on top of a couple of salads throughout the week — I’ve also been absolutely religious about taking my omega-3 supplement every morning. Coromega made that easy for me by sending over a couple of bags of their Coromega Max Super High Omega-3 Squeeze Packs, which are legit delicious. I look forward to it each morning — the flavor is superb, and the fact that it’s helping me keep my omega-3 to omega-6 ratio in balance? Even better. Other simple things I’ve done include tossing some chopped walnuts into my oatmeal in the morning — the texture is fantastic — and I include chia and flax seeds in whatever I can. Adding omega-3s is seriously one of the easiest adjustments I’ve ever made in my life. Opting into a meal delivery service. I never thought I’d be one to do a weekly meal kit service. I mean, I enjoy shopping and cooking — plus, well, with all my restrictions, who would cater to me? A friend recommended Hungryroot (which is 100 percent vegan and gluten-free), and it sounded like a good fit. They use healthy fats (olive oil, coconut oil, almonds), and complex carbs (sweet potatoes, cauliflower, quinoa), and include limited added sugars and limited sodium. While the ingredients come chopped and, in some cases, mixed and seasoned, it basically just takes away the busy work — I still put it all together and cook it, but nothing takes more than 10 or 15 minutes. I have always found it really, really hard to gauge improvement that isn’t easily quantifiable. If I can measure, say, range of motion or strength, that’s one thing, but trying to figure out whether or not something feels better … that’s exceedingly tricky for me. I shared my dietary plans with a friend of mine who is a chiropractor and went through something similar, and he recommended a BrainSpan blood test that shows your Omega-3 Index (meaning the percentage of EPA and DHA in my cells), Cell Inflammation Balance (ratio of omega-6 to omega-3 in cell), and Cell Toxicity Index (cellular palmitic acid levels). 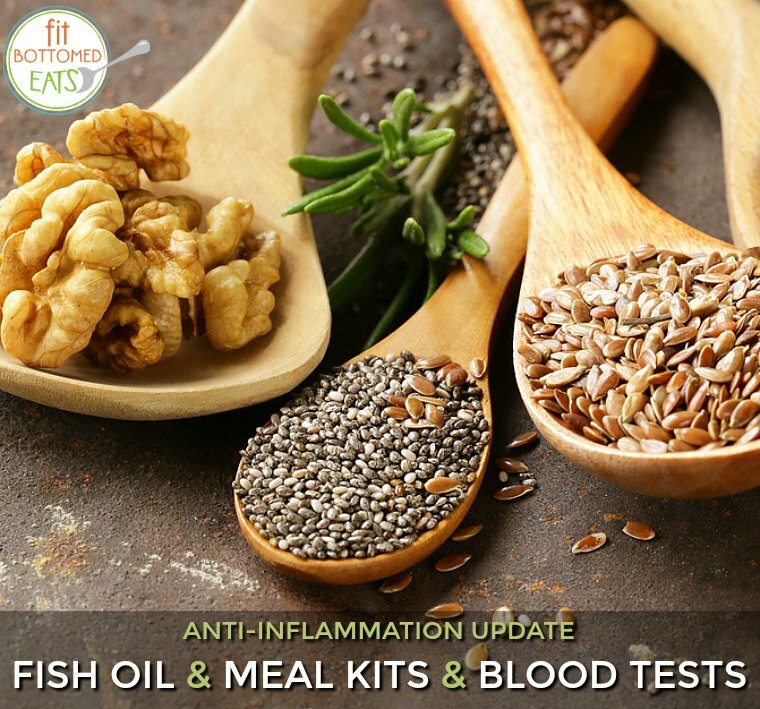 It also included some cognitive tests, because in addition to all of those levels being potential indicators of painful inflammation, they can also affect your cognitive function — makes sense considering the brain is nearly 60 percent fat, with the majority being omega-3 fatty acids. Based on my dietary history and levels of pain, we expected my results to be awful — and I was kind of psyched, actually, because if I were starting from the bottom, that would give me loads of room to improve! But that wasn’t the case. In fact, his response upon seeing my results was, “Who took your test for you?” I scored in the “optimal” range all around, which normally would have me jumping for joy (because I LOVE getting a good grade — gold stars are LIFE), but in this case … well, damn. I’m still glad to have taken it — it at least tells me that I’m doing a lot of the right things, and I’ll continue to do so. Whether I keep gluten and dairy out forever is up for debate, but I think the fact that I didn’t receive this result and immediately grab a loaf of bread and hunk of cheese is pretty telling. If this way of eating was really hard — or, honestly, just not enjoyable — there’s no way I’d be sticking with it for the time being. I don’t think I’ll ever change things back entirely — I mean, I am not giving up my morning omega-3 squeeze, and my salmon salad lunches are positively cravable. But I’m toying with the idea of introducing a bit of dairy and gluten back, especially when I’m eating in restaurants. It’s an easier thing to consider now, knowing that it’s not too difficult to go back to what I’m currently doing if it seems like a good idea.